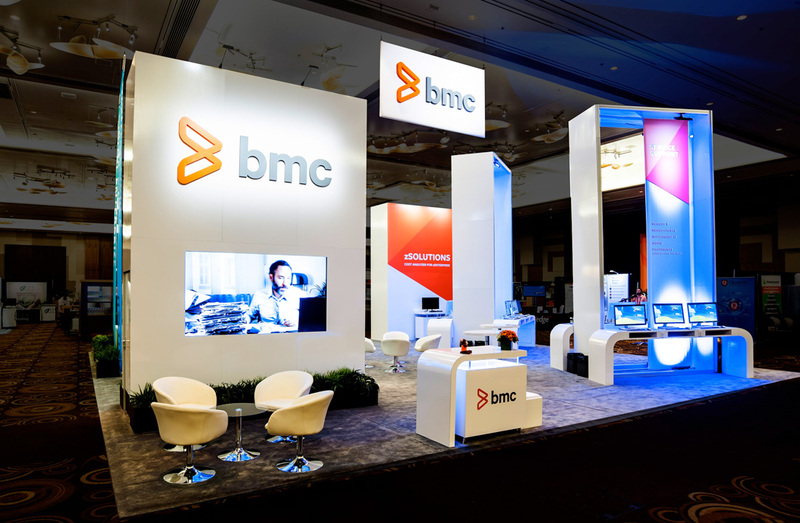 BMC customers, prospective customers, partners, industry influencers and employees from around the world gathered together to share insights and best practices for digital transformation for their annual IT Management Conference, called BMC Engage 2015. It’s a high-profile gathering, sporting a packed agenda and action-plan with seven new product launches, exciting demos and lively conversation, to seamlessly occur across the span of four-days. So when cool, sleek and streamlined technologies are the name of your game, your environment best be the polar opposite of bulky, clunky or chunky. With the BMC exhibit environment taking center stage in an otherwise staid, standard convention center ballroom, it was time for BMC to own the space as the coolest belle of the ball. A polished, modern presence called for tech-savvy interaction and comfortable, relaxing areas to further engagement. 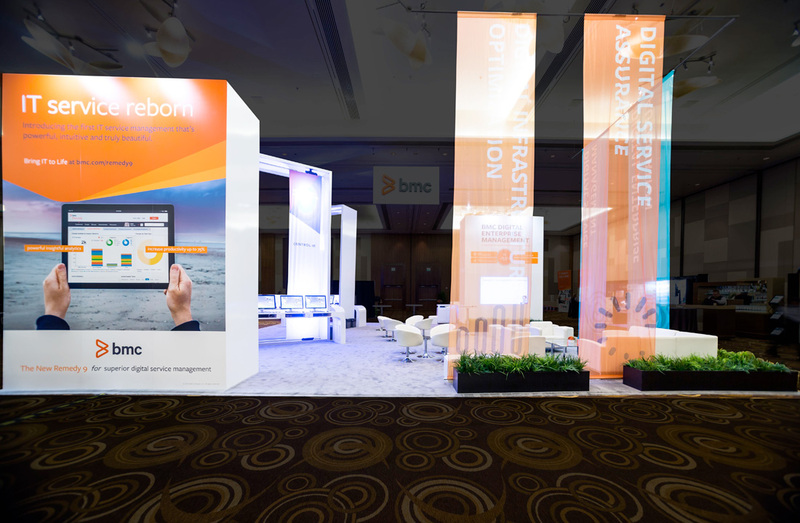 Every angle, corner and turn of the environment’s design was purposeful and strategically considered, with plans for a reception area, lounge, and demo kiosks to act as a magnet to attract attendees and give them the opportunity to see and experience BMC at their own pace. Clean and modern, with smooth lines and an inspired look and feel serving as key drivers for this 1,600 square-foot exhibit space. Sheer signature banners in BMC’s iconic and highly-recognizable color palette brought attention sky high, artfully branding the space, creating an open yet defined vibe. Six different types of seating in varying levels of comfort and size were strategically organized throughout the space, ramping up every available opportunity for engagement offering attendees that “just right” Goldilocks-like experience. A cool, lounge-like feel was in play with comfortable, mod seating offering ample room for impromptu and casual conversation. 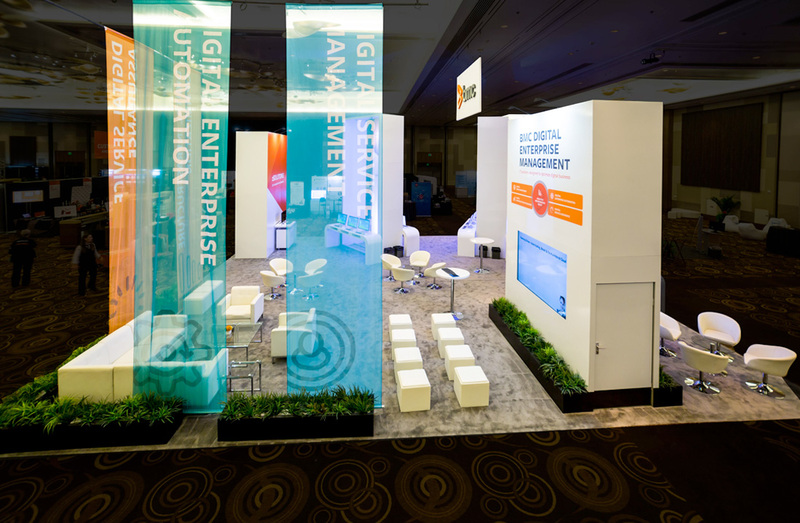 An abundance of workstations, each nestled in curvy, streamlined kiosks – were visible from every angle across the space gave the BMC Engage Team a savvy way to keep an eye on the traffic and activity, gage interest and bump up engagement. Clean, crisp imagery and branded graphics offered a soothing backdrop. Engagement was increased and, ultimately, results delivered. 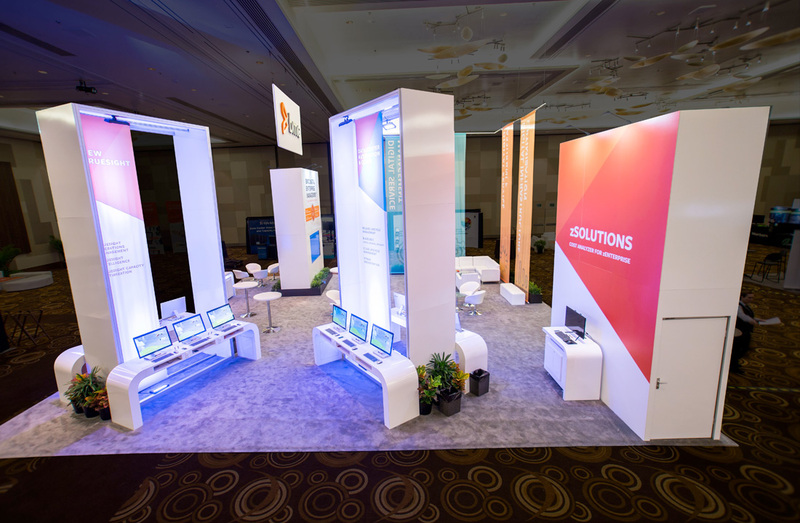 The exhibit environment provided the ideal backdrop for business meetings, one-on-ones and high-touch engagement. Beautifully reflecting the company’s key messages, the space delivered in spades. BMC Engage2015, so sleek, so modern, so refined -- may we have this dance?